After watching two of their movies back to back now, I ‘am left speechless over here. That feeling you rarely enjoy from the rarest of those movies, yeah I ‘am having some of them now. Yes sir, I ‘am speaking of the great Coen brothers. The two headed director who has (have) blessed our times with their supreme artistry in filmmaking. The two films were, ‘O brother where art thou?’ and ‘Miller’s crossing’. It was an experience which has got me thirsting for more and more. Above all these, it is the sheer intelligence exhibited in the plot development and presentation, which distinguishes the Coen’s Bros as film makers. The kind of talent involved in drawing two extremely different characters of Anton Chigurh and The Dude, with equal clarity, is indeed one of the rarest qualities. The Coen movies are the most wonderful show-case to characterization of greatest intensities. It’s extremely difficult to forget a character from a Coen movie, because they appear before us as almost complete human beings with a certain amount of eccentricity. I hear people complaining a lot about the vagueness in the plot of ‘No country for old men’, but before me it is the one of the greatest character studies of all time, where the film makers goes to such extent of realism in the plot for its ultimate aim of faithful character elucidation. ‘O brother…’ is also basically a very beautiful character study (a lot of characters), where the only difference is that the characters are a bit more fictional (the right word is poetic). The comedy in Coen movies is of the highest quality, which is a right mix of the dialogue driven type and the situational type. ‘Big Lebowski’ is one movie that had made me laugh the most. A guy who has seen this movie first, wouldn’t recognise ‘No country…’ as a work from the same directors. That is something indeed, right? The intense detailing in the plot is another important aspect. Like in the case of Miller’s crossing. The plot is very complex and thick but quiet ingeniously offered. It would require you a couple of watching to recognise the cleverness in the plot. 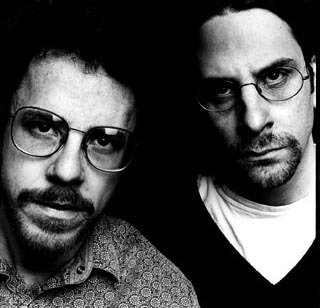 The technical side of Coen brother’s movie making is also as rich as the creative side. The photography, editing etc. are almost flawless. The Visual language is stunning. Music, BGM etc are also of the topmost quality and is of perfect coherence. I read that the sound track of ‘o brother…’ was a bigger hit than the movie itself! No wonder. Now, I haven’t completed their filmography yet. Highly acclaimed movies like ‘The man who wasn’t there’ and ‘Blood simple’ remains in the yet to watch category. But am already on it, anyway. Oh and yeah, without people like Coen Brothers and their works, how dreadful our lives would have been…! This entry was posted on Thursday, November 27th, 2008 at 3:53 am and is filed under English Movies, funny, great men, Ideas, inspiration, Movies. You can follow any responses to this entry through the RSS 2.0 feed. You can leave a response, or trackback from your own site. it realy inspired me to watch..the movie you listed..
i have watched only..”no country for old man”.. I think my favorite Coen brothers movie is Fargo. I have the DVD too. No Country For Old Men is also quite good, though it could have been much better. and which is ur favorite in the comedy genre? You will like The man who wasn’t there.